I bet you think I'm spoiled, and I guess I am! I recently finished paying off some major bills, and I've rewarded myself by purchasing some goodies. That must seem counter-productive, but like many people, I am inspired by new purchases! The thread is from Tatskool's mouth-watering collection of colors: CocoLime, Rusty Red, Bracken Crunch, and Antique Bronze. The shuttle is from Chris and Erin Hinton at The Shuttle Shop. The mitten pin is from Paulette at Beedeebabee... a beautiful decoration for my winter coat! Yes, I've been tatting on and off today... pictures tomorrow! I only had about an hour to tat yesterday, but I managed to get a good start on "Beatrice." I forgot to do one thing. I usually write all the numbers in for the rings and chains before making my copies. Oops! I guess I'll just have to pay attention! Would you like to tat along with me? 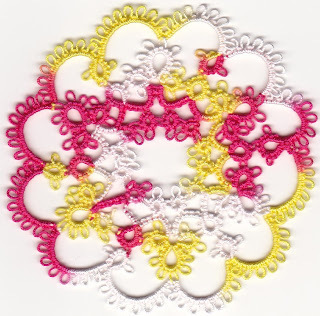 I've been inspired to get back to some serious tatting! Yesterday I received my newest basket from Grizzly Mountain Arts, and it's the perfect size for holding a new tatting project! I do have a confession to make... since joining facebook to keep in touch with high school classmates, I've been distracted by the farm games. Last week I timed myself to see how much time was being sucked up by these games, and I was shocked at how much valuable time was just slipping through my fingers! I need to break the addiction! My solution... tat one of my favorite patterns, "Beatrice" from Tatted Doilies by Iris Niebach, using my favorite thread in the world... HDT! I tend to spend way too much time trying to decide which pattern, thread, and/or shuttle to use. Not this time! I went to my bookshelf and pulled off Iris's pattern book. Then I went to my thread stash... you wouldn't believe how much HDT I have just waiting for the perfect pattern... and grabbed the first skein of thread I saw. In this case, it's Tatskool's Raspberry Sorbet... probably a poor choice since my mouth will be watering the whole time I'm tatting! I'll try to control myself! But then, I had to choose a shuttle. Those of you who have been reading my blog for a while have seen my shuttle collection... well, most of it. I decided to use two of my GMA flat shuttles as thread winders, and one of my GMA post shuttles for the actual tatting. I am fascinated by the way Iris's pattern weaves in and out between the center and the edge, but I get easily confused. So, I enlarge the pattern and make one copy for each pattern repeat. I pencil in each chain and ring as I complete it. That way I make fewer mistakes. Notice I said fewer... I know I'll still make mistakes! Now I'm set to tat! I probably won't go cold turkey giving up the farm games, but I know that by using some of my favorite tatting supplies I'll be more inspired to live up to my chosen name... Lace-lovin' Librarian! On the sock blockers... I still see pointy toes! Off the sock blockers... I still see pointy toes! It sure is hard to get a good picture when it's still dark outside! Same pattern, same thread, same frame as #1... I need to do a little experimenting to figure out which threads and patterns will result in a snowflake that will fit in the frame. Right now, I don't have enough brain power to do that, so I'll just stick with the tried and true! The Bears are playing terribly today, so it's very easy to sit and tat! I think "Itsy-Bitsy Snowflake" is my favorite pattern in Samantha Melnychuk's A Veritable Tatted Blizzard. I used Cebelia, size 20. I've tried using the metallic threads for more glitter, but with very poor results. I looked all over for these little picture frame ornaments the past two years, and it was well worth waiting for after-Christmas clearance sales! I sure I am glad I found my stash in time for Christmas this year! No, we haven't started decorating for Christmas yet. Dave has so many trees, it's hard to find places to store them. So, one decorates our back porch year round. It works for me! and pretty soon I've accomplished something! I"m having a hard time finishing my pointy toed socks. I'm just not in love with either the toe or the yarn. I will finish them though. I joined a sock club, and I really want to work with my new yarn, but not until I've finished this sock! The teal and goldenrod is the first of my new pair of mittens! The pattern is from my blog buddy Carolina. It is wonderfully written and easy to follow! I need to add the cording around the wrist, but otherwise, this mitten is finished! I really did start to clean my sewing room, but I didn't get very far! I found three packages of socks that need some lace edging. I know that tatting would look much nicer, but I can crochet edges on a pair of socks in an hour. I can't tat that fast, and I need to get these off to my granddaughters before they're too big to wear them! To be honest, Ella will be getting socks that I bought for Lily. Lily will be getting socks that I bought for Eva, and Eva will be getting socks that... well, you get the idea! Where's my tatting, you ask? Well, I just pulled out a ball of white thread, a shuttle, and a pattern book. While I was cleaning, or starting to clean, I found picture frame ornaments that I bought on clearance a year or two ago. I got the idea to put tatting in the picture frame ornaments from Gina. If I get them made up, my Christmas to do list will get much shorter. Get your shuttles ready, Tattycat! It's time for the flurry of snowflakes to begin! I"m sure many of you know about LadyShuttleMaker's Mondo Monday Giveaway... well, I was the lucky first winner! Believe it or not, the gorgeous HDTs she sent me are the perfect match for my CQ block. To the left of the shuttle is "Leaf Braid" from Tatting With Visual Patterns by Mary Konior in size 20 silk... yes, silk! If you haven't tatted with silk yet, you are missing out on a very special experience! I don't need any more books. 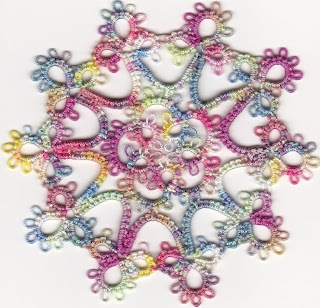 I haven't had time to do much tatting/knitting/crocheting/CQing/reading, but Elegant Stitches was recommended to me, and the other two were recommended by Amazon. And so, I ordered them... just because. With the days getting shorter, I really need to use my scanner to get good images. However, I haven't been able to use my scanner since I upgraded my OS to Snow Leopard. All I needed was a little time off (courtesy of Columbus Day), to figure out the problem. I needed to download the new scanner driver. It didn't take long, but I did need a little down time to get my brain headed in the right direction! Here's the Japanese motif I was working on. I messed up on the last ring... forgot one picot and twisted the join... and it took me a while to undo my mess! I'm very happy with the final product, and it's the right size for the coasters I've been making. This is Altin Basak #3003, size 50. I really like this thread... until I have to retro-tat! I have to be very careful to not shred the thread! I also messed up on Sheila York's pattern from Projects in Tatting. How is it that I can tat for months and have no problems joining, and then I mess up three joins in a row? It must be a mental block! I love the way Confetti Sprinkles from LadyShuttleMaker tats up. This one looks good enough to eat! I took some time to work on my CQ block this weekend. I didn't get much done... I was having too much fun looking at CQ books for inspiration! I should have done all my embroidery stitches first, but a little piece of tatted lace was just calling to me to be put in its corner, and I just had to do it! Then, I felt the need to add some purple crystal beads under the fairy... shimmering water, you know! Dave and I went to southwest Michigan to tour some wineries on Saturday to celebrate our 29th anniversary. It was a beautiful day, and we really enjoyed ourselves! I worked on dish cloths while we were driving. A friend of mine asked me to knit 12 for her to give as Christmas gifts. After seeing how pretty the new ones look, I really think I should knit some new ones for myself! Hi everyone! I'm so excited! My daughter Alison has started her own blog. She's a very talented young woman. I hope you'll all visit and leave her some comments! A new showcase for my tatting! I have been fascinated with crazy quilting for a long time, and I spent a lot of time reading blogs and books about crazy quilting when I broke my wrist (almost two years ago!). Melissa at Honey Bee's Bliss became a particular CQ friend and sent me some lovely supplies to get started. I frequently pull out my stash and look at it, but I just didn't have the confidence to begin! In the meantime, I found Pat Winter's blog and continued to dream about creating lovely CQ pieces myself. This summer, Pat announced that she would be giving CQ lessons in her summer kitchen as soon as she and her hubby finished transforming it into a studio for lessons. When I found out that Pat lives about an hour or so away from me, I jumped at the chance! I called my daughter Alison and my friend Pat, and I asked them if they would join me for a day of fun. Of course they said yes! Pat W. asked us if another lady from Michigan could join us, and we were happy to meet someone new. So, three Pats, one Alison, and one Diane spent a lovely day together yesterday! and our afternoon task was embellishing. We had a perfect day for creating beautiful pieces. There was just enough rain that we would not have been able to pursue many outdoor activities... not that any of us needed an excuse for playing with luscious fabrics, ribbons, laces, and beads! The sun peeked out through the rain clouds on and off throughout the day, and it kindly shone at lunchtime so that we were able to eat our lunches outside. I would highly recommend one of Pat's classes to anyone who is interested. In fact, we enjoyed ourselves so much that I'm sure I could talk Pat and Alison into going with me again! Look at all the goodies that I brought home with me! Pat generously put together enough materials to really hook us on crazy quilting. I had to have a copy of her book. After all, I am a librarian! Here's some of Pat's hand-dyed silk ribbon for embroidery, and a little wire teapot filled with goodies (candy, cookies, tea).